â€¢	Modular Configuration â€“ The entire system is created so that the various wearable elements, like the USB connections can be accessed and swapped out if needed. â€¢	Greater compatibility â€“ The USB DupeBox has the ability to work with a larger array of USB pen drives on the market. 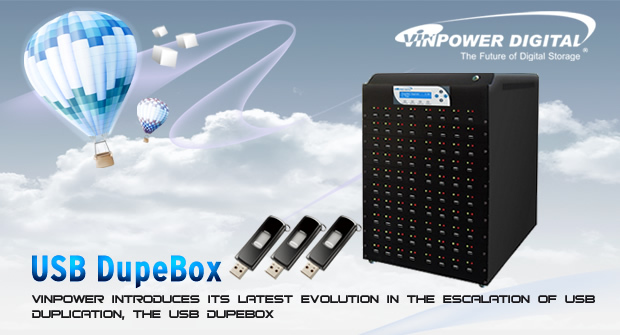 This is just a sample of some of the improvements and abilities the USB DupeBox offers. If you provide USB duplication as a service, The USB DupeBox allows you to cut your time down dramatically by allowing you to copy more pen drives in a single operation. Check it out for yourself. Vinpowerâ€™s Standalone Printer Controller works with an array of optical disc printers and is so easy, anyone can use it. Why waste a perfectly useful desktop or laptop computer dedicating it to your disc printer when it could be put to much better use for other important tasks, like checking Facebook. Vinpower’s compact lightweight standalone printer controller, model # VPD-PRT, allows the user to load multiple print files onto a USB thumb drive & print your discs virtually anywhere across a variety of optical disc printers. Vinpower has worked with a number of printer manufacturers to allow our printer controller to be paired with a wide selection of optical disc printers to give the user the opportunity to choose the printer they are most comfortable with. The standalone printer controller is perfect for those who use volunteers or employees that are not accustomed to operating a disc printer, because it simplifies the print process so that anyone can use it. Even those that are not as technologically savvy can easily operate the Vinpower standalone printer controller. 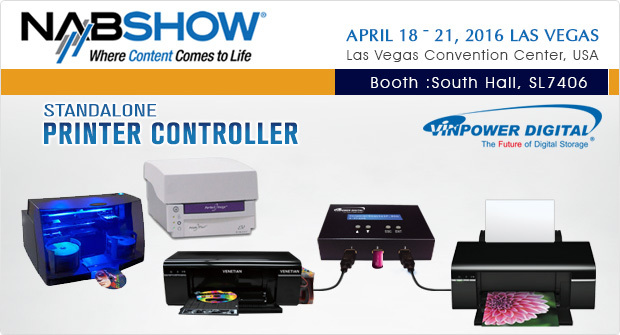 The VPD-PRT will be on display at Vinpowerâ€™s booth, South Hall (Lower) – SL7406, during the NAB trade show April 18th through 21st for anyone that would like to see the system in action for themselves. For more details on any of the products that Vinpower carries, please visit our website at www.vinpowerdigital.com or speak with an official Vinpower representative near you. The iConnect Mini can double as your traveling media library. You can store an incredible amount of music, movies, and more for instant access across multiple Apple iPhones, iPads, and iPods. Have you ever had to remove your music from your iPhone or iPad because there just wasnâ€™t enough space to store that and the massive collection of pictures, videos, emails, and or text messages using up all of the devices memory? You may not miss it initially because you can watch or listen to movies and music through an online streaming service. But what about if you didnâ€™t have internet access or you were close to using up your allotted data minutes and you didnâ€™t want to pay the overage charges, how will you watch and listen to your favorite entertainment then? The iConnect Mini allows the user to store a tremendous amount of music, movies, ebooks, etc., and play them back through any iPhone, iPad, or iPod with a lightning connection*. Now that many of the airlines are charging for the inflight entertainment, you can bring your iConnect Mini and watch your favorite programs for free and at your convenience. Maybe you want to get some work done while on a flight, but donâ€™t want to pull down a bulky laptop to try and balance on the tiny tray from the seat in front of you. Instead, transfer your work files from your computer to the iConnect Mini through the USB connection, then review all of your documents through your iPhone or iPad without needing extra space or internet access. There are so many possibilities with the iConnect Mini beyond simply backing up photos and videos quickly, making the iConnect Mini as essential to you as your mobile phone. 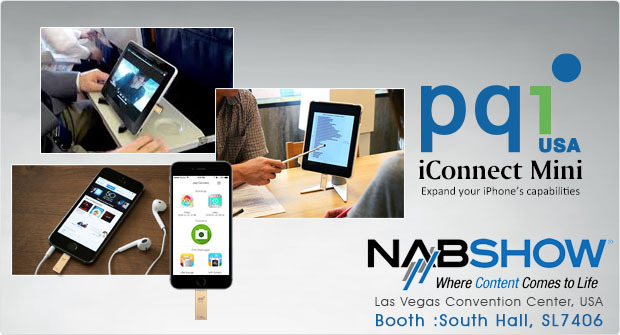 See for yourself at Vinpowerâ€™s booth during the NAB trade show April 18th ~ 21st at the Las Vegas Convention Center in Las Vegas, NV. For more details on the iConnect Mini or any of our line of mobile accessory products, please visit our website at www.pqiusa.com or speak with an official PQI USA or Vinpower Digital representative near you. *The PQI iConnect Mini APP is required and can be downloaded for free from the Apple App store.